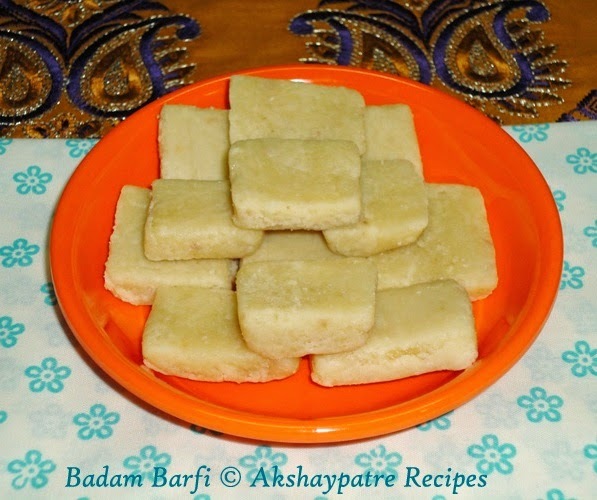 Collection of barfi recipes - Burfi is a Indian fudge made using milk and milk based products like khawa or mawa, condensed milk, ghee and milk powder. Preparing burfi with milk by condensing is time consuming. 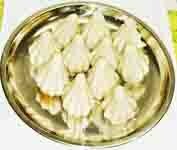 Khawa is available in dairy product shop very easily. I have posted several burfi recipes earlier. 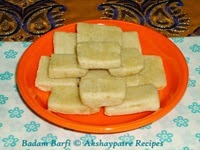 In this section I have compiled barfi recipes for your convenience. Burfis are made in special occasions, especially during Diwali festival burfis are essential sweet. To make perfect burfi you must need to check the proper consistency of mixture. So while making burfis do not cook the mixture till too hard or too thin. Burfis are cut into square or rectangular shape. Badam Burfi - Most popular Indian sweet made with almonds. This home made sweet is always better than shop bought. Melt in mouth sweet take 1 hour 30 minutes. But the effort is worth in the end. 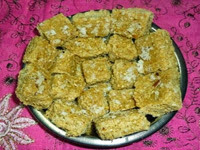 Tilgul Vadi - Sesame seeds burfi is a traditional sweet prepared during Makar Sankranti festival. This is a very delicious and quick to make sweet. This sweet does not use milk or khawa. It uses sesame seeds, coconut and jaggery. 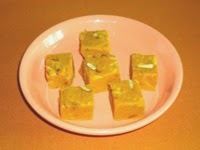 Mango Burfi - Mango burfi can also be made with pedha which is made with khoya. During off season, tinned mango pulp can be used. I have used pedha in the place of khawa, however you can use khawa and if khawa is used then increase the quantity of sugar according to your taste. Raagi ( finger millet ) Manni - This is a soft burfi usually made during Jnmashtami in Karnataka. Traditionally it is made by soaking the finger millet for 5-6 hours, then grind to fine paste. this paste is then strained through a muslin cloth to get a smooth finger millet paste. This paste is used to make manni. 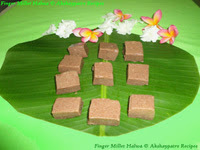 But I have used finger millet flour to make a quick burfi.